Raccoon Proof Bird Feeder Pole system is a Top Bird Feeder Pole. Bird feeders hung above its long raccoon baffle are raccoon and squirrel proof. 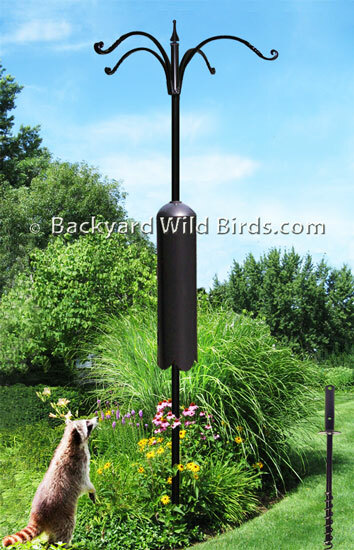 Unique Pole comes with four bird feeder hanger arms, a long 28" black cylinder raccoon baffle and a twister ground socket. This large raccoon baffle does an excellent job on this 7.5 ft tall bird feeder pole. Now don't feel bad that the raccoons and squirrels are not able to defeat and climb this pole, just be glad they can't! The tubular steel pole has a 1 in. diameter and comes in three pieces. The four hanger arms are wrought iron and have a 12" reach on each arm. It is approx. 90 inches above ground. The 28 inch long raccoon baffle comes with a mounting clamp that can be adjusted for its proper height setting. Stop raccoons and squirrels by mounting the pole 10 ft away from objects and the raccoon stopper baffle about 4.5 ft off the ground. The 20 inch ground socket has 1/2" turning holes to twist in place. Its finish is black semi-gloss, rust resistant, powder coat. Complete your bird sanctuary with some nice bird feeders and hanging plants. 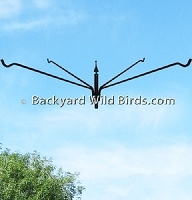 See our other "Bird Feeder Pole Systems" for examples and great ideas!